The New York Times reports that deputy Attorney General Rod Rosenstein talked about wearing a wire to record Trump’s insane prattering, and spoke of invoking the 25th amendment, which allows the cabinet to remove the president if he is incapacitated. Rosenstein’s office says that the remarks were facetious. They were recorded in memos by former FBI deputy director Andrew McCabe, that somehow came into the possession of NYT reporters. Trump has wanted to fire Rosenstein for some time, and this news report (which Rosenstein says is full of inaccuracies) could well push the volatile hotelier over the edge. One reason Trump wants to get rid of the deputy Attorney General is that he oversees Robert Mueller, who is investigating the Trump campaign for evidence of collusion with the Russian Federation in electoral irregularities that may have won Trump the White House. Trump has speculated about firing Mueller, who has indicted a number of close associates of Trump. But the president cannot fire Mueller. He works for Rosenstein. If, however, you fired Rosenstein and replaced him with a dutiful Trumpie, then the new deputy AG could fire Mueller, or could just bury his investigation. But that series of events leads to the Great American Apocalypse. Let’s say the Republicans in the Senate put Kavanaugh on the Supreme Court next week. 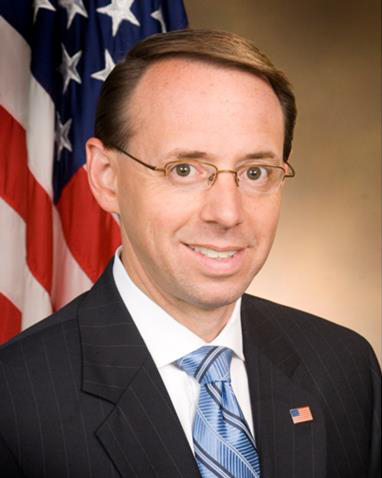 And let’s say Trump fires Rosenstein next week. The Senate would likely have to confirm any successor appointed by Trump (just as that body confirmed Rosenstein). So let’s say Mitch McConnell can march the appointment through promptly, before the midterms. The House and the Senate may both fall into Democratic hands in November. And let’s say that Trump has the new guy fire Mueller and discontinue his investigation, and that Mueller’s findings are not released. The new Kavanaugh Supreme Court would back Trump in the firing and suppression of Mueller. Then I think we’re heading to serious steps toward impeachment early in the new year. But what if Trump, who isn’t known for his collegiality or grasp on reality, announces that he won’t step down under any circumstances? What if he tells Mattis to put tanks in the streets to put down building protests, and emulates Lincoln in declaring martial law and a suspension of habeas corpus throughout the United States, this time without Congressional approval and in defiance of Posse Comitatus? (Trump after all doesn’t know what that is). What if Mattis says ‘no’ and Trump fires *him*? Since the 25th amendment specifies that the vice president and 14 cabinet members are needed to remove the president for being incapacitated, I doubt that Pence would do it. But if Pence won’t do it, does he become implicated in Trump’s crimes? If the Dems have Congress, they could refuse to confirm a replacement for Mattis. At that point, the fate of the nation would be in the hands of deputy Secretary of Defense Patrick M. Shanahan. He is a civilian who came out of Boeing, rather than a military man. Would he buck Trump if he was ordered to implement national martial law? Would the Joint Chiefs of Staff go along? Again, the Kavanaugh court would likely prove useless in challenging any Trumpian extra-constitutionality. If so, Nancy Pelosi could be president by next February (the speaker of the house is next in line after the vice president). But then the possibility of a revolt by the Trumpies, who include Neo-Nazis and biker gangs and other criminal elements, rears its ugly head. And, could Putin stand by and see an administration come to power that might challenge him in the Ukraine and Syria? Would Pelosi need a taster to avoid being poisoned? Or, a whole new scenario. What if the Dems fail to take either house of Congress in November, and the Republicans go along with the declaration of martial law, and refuse to consider impeachment? And what if the Kavanaugh court sides with Trump that Posse Comitatus is unconstitutional? Then, game over for the 242-year-old experiment in American democracy. This time, the Friedman unit will determine the fate of these United States of America.